I was getting a perm at the salon and waiting for the timer to go off. Looking at all the other women staring into space, I decided we needed something gripping to read to kill time. What if one of these women ended up dead? Thus was born my Bad Hair Day mystery series featuring hairstylist and salon owner Marla Shore. Not at all. 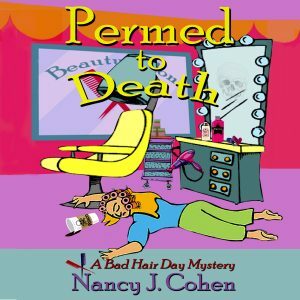 I have 12 published books in this series, and this is my first audiobook. I had to get the audio rights back from the publisher. I've wanted to get my books into audio for a long time as another avenue for readers and listeners to access my work. I went through ACX and vetted a number of narrators before choosing Mary Ann Jacobs. I love how she does the different characters and her voice for Marla.